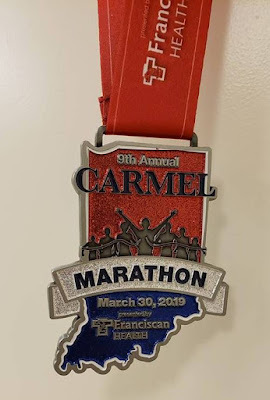 On March 30, I ran the Carmel Marathon. Carmel is on the north side of Indianapolis, and the Carmel Marathon is the second largest marathon in Indiana. I had never done this race before, but it was recommended by friends who live in Indiana. Also, since I’m working toward a fourth circuit of 50 states, I needed another Indiana race. I flew to Indianapolis on Friday and stayed at a Hampton Inn that was about two miles from where the race starts and finishes. After checking in, I went to the expo at Carmel High School to pick up my race packet. Two of my friends drove from out of state to lead pace groups. Aaron was leading the 3:35 pace group. Sandy was leading the 5:45 pace group. I had dinner with Aaron at a local pizzeria. The race started and finished next to the Center for the Performing Arts. The course was like a figure eight. The first half was a big loop through neighborhoods on the east side of Carmel. The second half was a different loop through neighborhoods on the west side of Carmel. The half marathon just did the first loop. The website for the race had a map of all the parking areas near the start and finish. The most convenient was a public parking garage attached to the Booth Tarkington Civic Theatre. I wanted to make sure I knew how to get there in the morning, so I drove there after dinner. It only took a few minutes to get there. The parking map on the website showed where you enter the ramp and where the street would be blocked off in the morning. Later, I met Sandy for beer flights at one of the local breweries. I got to bed at a reasonable hour, but struggled to get to sleep. At first, I was sleepy, but I was too hot, and I was distracted by the bright LED display of the alarm clock. Eventually, I peeled back the blanket and covered the alarm clock with a sock. Now, I didn’t have any distractions, but I was no longer sleepy. I eventually nodded off, but woke up again after only 10 or 15 minutes. I never got back to sleep again. When I eventually got up, I felt pretty crappy. I did what I always do. I started getting ready for the race. Sometimes I sleep poorly and feel tired, but still have a good race. I was skeptical, but sometimes you just have to start the race and see how it goes. A cold front moved through on Saturday, bringing cooler temperatures. When I got up, it was 56 degrees, but that was the high temperature for the day. By the time the race started, it had cooled to 55. During the race, the temperature dropped into the 40s. Ordinarily, those temperatures would be fine, but it was also raining. From the hourly forecast, it seemed possible it would rain all morning. It seemed equally possible that the rain might come and go. That made it hard to know what to wear. I wore tights and a T-shirt, and also wore a plastic rain poncho. I was taking the risk that I might get too hot if the rain stopped. Since I knew we would start in rain, that seemed better than risking being underdressed. I got to the parking ramp early and had no trouble finding a place to park. About an hour before the race, I left the ramp to go to the bathroom. The only bathrooms available were port-o-potties near the start corrals. I had to walk about a block in the rain, but there weren’t any lines yet. After that, I wanted inside the atrium of the Booth Tarkington Civic Theatre. In my last race, I broke 3:35 and qualified for Boston. The natural goal for this race was to see if I could improve on that time. Even a small improvement could enhance my chances of getting into next year’s Boston Marathon. In my last two races, I had good success running with pace groups. Aaron was pacing the 3:35 pace group, so my plan was to start the race with him. If I had a good race, I’d go ahead on my own in the late miles. If not, I would hang on for as long as I could. I was feeling weak and shaky from the lack of sleep, so I had serious doubts about whether I could have a good race. Since I already had a qualifying time for Boston, I had nothing to lose by trying for a faster time. The worst thing that could happen is the pace would break me and I’d struggle in the second half. At this point, my only goals were improving my qualifying time and extending a streak of four consecutive sub four hour finishes. If I couldn’t run 3:33, I’d be happy with 3:59. About 15 minutes before the race, I went outside and made my way into the start corrals. I spotted Aaron and lined up near him. By the time the race started, my shoes were already soaking wet. One of the advantages of running with a pace group is you don’t have to think too much. As we started running, I just followed Aaron. I didn’t bother checking my pace. I let him worry about that. I mostly worried about staying with him. In the first mile, I had to work to keep from getting bottled up behind slower runners. The first mile of every race is like that. Shortly after the start, we turned and headed south. I could really feel the cold wind. I also felt the insole moving inside one of my shoes. This sometimes happens when water gets in my shoes, but I’ve never experienced it in the first mile of a race. When we reached an aid station, I was reluctant to drink anything. I was cold and wet, and I didn’t feel the least bit thirsty. I drank some Gatorade anyway. I reminded myself I might get hot later if the rain stopped. If I overheated later, I’d be glad I started hydrating early. Just past the two mile mark, we turned left and headed east. I immediately felt relief from the wind. By time we got to three miles, the rain seemed to be stopping. Now I felt too warm. Aaron discarded his rain poncho. Two other runners in the 3:35 group discarded trash bags they were wearing. I didn’t want to throw away my poncho, but I pushed the hood off my head, and I took off my gloves. At five miles, we made another left turn and headed north. I still wasn’t feeling any wind. I started to get really hot on this stretch. I regretted wearing the rain poncho, but I still didn’t want to throw it away. By the time we got to six miles, it was too much work to stay with the group. I had to slow down and run my own pace. To find a pace that felt sustainable, I had to slow down a lot. I started to wonder if I could even sustain nine minute miles. I felt like I tried to stay with Aaron too long, and now I was blowing up. I still had 20 miles to go. At around seven miles, we turned into the wind again. Now the wind made me feel more comfortable. I forgot to check my time at seven miles, but at eight miles, I saw I had slowed to 8:53 per mile since dropping back from the pace group. That’s a little faster than a four hour pace, but it still felt tiring. I expected to continue slowing down. Before the end of the next mile, a big group of runners went by me. It was the 3:40 pace group. That was no surprise, but it made me realize how many runners were passing me since I slowed down. My ninth mile was 9:02, and it still felt too fast to sustain. I now had doubts about whether I could even break four hours. This part of the course had some zig-zags. Sometimes we ran north and sometimes we ran west. The wind was strongest when we were headed west. At about 10 miles, I started to notice cold wind gusts. Then it started raining again. At first, it was just drizzling, and it felt good. Over the next few miles it turned into a steady rain, and I started getting cold. Earlier, I regretted wearing the rain poncho. Now I was glad I had it. I wondered if other runners would regret getting rid of theirs. I was tempted to put my gloves on again, but that’s easier said done. They’re a snug fit when they’re dry, and now they were wet. To put them on, I’d have to stop, and I didn’t want to stop, even briefly. I pulled the hood back over my hat. That helped keep some heat in. I started to feel a blister in the arch area of my left foot. That’s the same shoe where my insole was slipping forward, which no doubt created extra friction. The same thing happened during the Little Rock Marathon four weeks ago. At around 11 miles, we turned onto a paved bike path. We crossed a bridge with an aluminum bridge surface. With the rain, it was slippery. After another mile, we turned left and merged onto another paved trail. I saw a “25” sign. We were now on a segment of the loop that overlapped with the loop we would run in the second half. For the next 1.2 miles, I was getting a preview of how the race would end. We left the trail and crossed Main Street. We were in the arts district now, and I recognized businesses I had driven past on Friday. After a few more turns, we came within sight of the halfway point. Half marathon runners kept right and ran to the finish line. Marathon runners kept to the left and began the second loop. I reached the halfway mark in 3:53:01. Apparently, I had picked up my pace a little. I could break four hours just by running 9:30s the rest of the way. My recent miles had been faster than nine minutes, so I was now confident I would break four hours. After running through the start/finish area, we made a few turns and ran across some brick streets and patios. It took some work to navigate around the puddles. Then we were on the paved trail again. Now that I was more than halfway done, I felt more confident. My pace had stabilized and the remaining distance seemed manageable. My hands were getting really cold, but they still had color. As long as they were a bright pink, I didn’t need to be too concerned. It they turned white, that would be worrisome. I didn’t check my watch again until 16 miles. Since the halfway mark, I was averaging about 8:40 per mile. Now I started to wonder if I would break 3:50. That was encouraging, but for now I only had three goals. I wanted to finish; I wanted to break four hours; and I wanted to take a hot bath. Along the trail, we were somewhat sheltered from the wind. Shortly after 16 miles, we turned onto a road and headed straight into the wind. I kept telling myself we would eventually get a tailwind. Until then, I just had to tough it out. I also had to tough out the blister pain, which was getting worse. The course zig-zagged a few more times. We’d head west, then north, then west, then north. I think we had a headwind going west and a crosswind going north. They both felt about the same. Anything other than a tailwind was freezing. The rain eventually let up again, but I was still cold. Running into the wind, I felt the wind blowing into my hood. It helped kept me warm, but I had to push it off my head to eliminate the wind drag. I was no long getting passed by anyone. Now I was passing other runners. I started working harder to make sure I kept up with the strongest runners around me. From 16 to 18, I averaged 8:51, but then I ran several miles in the 8:40 range. There was no longer any doubt I would break 3:50. Now 3:48 was a realistic goal. Eight weeks ago, I ran the Surf City Marathon in 3:48:03. At the time, I was happy with that time. If I could beat that time on a day when I was having a bad race, that would be something to feel good about. Carmel has lots of roundabouts. The race included several of them. Most of the time, we were continuing on the same street, but it was a challenge to run the tangents. At one, we were effectively making a left turn, but we had to going around on the right. I was annoyed that we had to take the long way around. In the late miles, I wondered when we would finally get a tailwind. Sooner or later, we had to go east to get back to the center of town, but for now, we were mostly running north. I had a vague idea of where we were, but I wished I had taken a longer look at the course map. Just before 23 miles, we turned right, and I finally felt relief from the wind. Unfortunately, it didn’t last long. We made another turn and headed north again. I had no idea where we were until I saw a runner on my right going the opposite direction. At first, it looked like he was on a road that ran parallel to ours. Then I realized it was the same paved trail we would finish on. We continued north a bit farther, and then we made a 180 degree turn onto the trail. Now I knew what to expect the rest of the way. We would run south on the trail for about a mile and then repeat the section we ran at the end of the first loop. I started to pick up my effort. I reached the 25 mile mark in 3:35:24. By now, Aaron and his group were already finished. Then I realized my 25th mile was eight minutes exactly. That was my fastest mile of the race. As I left the trail and ran though the arts district for the second time, everything looked familiar. I tried to keep up my pace, but my blister was killing me and my hands were freezing. Each turn was now familiar. That helped. I don’t usually check my watch at 26 miles, but I was curious to know if I ran as fast as the previous mile. Not quite. This one was 8:05. I made the last turn and raced for the finish line. I finished in 3:45:09. I didn’t just beat my Surf City time. I also beat my time from the Hong Kong Marathon. Nine miles into this race, I felt like I was coming apart at the seams, and I expected to have positive splits by more than ten minutes. I still had positive splits, but by only 1:07. I really limited the damage after blowing up at six miles. The finisher medal is in the shape in Indiana. I like that, since I chose this race, in part, to get another Indiana race. As I rounded the corner, I got a carton of chocolate mile. Another volunteer handed me three donut holes. I passed a table with lots of other snack foods, but I didn’t feel like eating anything else. On the other side of the street, I saw people sitting at tables under a large canopy. They were eating something. I forgot. They have post-race pancakes and sausages. I still didn’t feel like eating, but I had to have at least one pancake and at least one sausage. They had blueberries and maple syrup for the pancakes. I’m not usually a big fan of breakfast sausages. They’re too salty. After a race, however, they taste great. Eating the pancake was difficult. My appetite came back quickly, but my hands could barely hold onto the plastic utensils. I was sheltered from the rain, but I was still eating outside. I had to eat quickly, because I was getting cold. I overheard one of the volunteers say the temperature had dropped to 43 degrees. When I stood up and started walking, my blister hurt more than ever. I wondered if it popped. Between the blister and the insole scrunched up inside my shoe, walking was painful. I stepped in an awkward way that made my Achilles tendon uncomfortable. I hobbled through the Booth Tarkington building to get to the parking ramp. Getting into the car took a minute. Putting on my seatbelt also took a minute. Driving back to the hotel was easy. Hampton Inn was inside the course, so I didn’t have to cross the course to get there. Walking from the car to the entrance wasn’t so easy. I was freezing, and my blister pain once again made me walk in a way that made my Achilles tendon tighten up. It took time to get out of all the sopping wet clothes. I was surprised to see my fanny pack was just as wet. It was underneath my rain poncho, so it was never exposed to the rain. It was wet with sweat. Even though I was cold, underneath the poncho, I was sweating like crazy. That probably explains why I drank Gatorade at almost every mile yet didn’t need to pee. All of my fingers were turning white. After a few minutes in a hot bath, the color came back, but they felt tingly as they were warming up. The painful blister on my left foot was a blood blister the size of a quarter. Surprisingly it didn’t pop. I didn’t get a faster Boston qualifier, and I’m no longer improving with every race. That streak couldn’t last forever. I think my recent string of good race results made me overconfident. There’s a reason I love marathons in a way I’ll never love shorter races. No matter how many you’ve done, this distance can humble you.